For the past few years, he had been paying a maid levy of $170 a month. But on Monday, when his mother showed him last year's annual statement from the Central Provident Fund (CPF), he was shocked. It showed he had been paying double at $340 monthly. 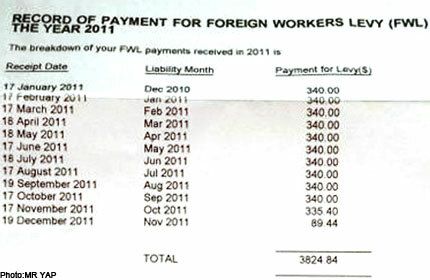 It was a printing error on the part of the CPF Board, and about 44,000 employers of foreign domestic workers had received it. The man, who wanted to be known only as Mr Yap, said he hired a maid to take care of his mother. Recalling the moment he read the statement, the 40-year-old manager of a publishing company said: "I panicked as the amount was considerably more (than what I was supposed to pay)." On Tuesday morning, he called up the Ministry Of Manpower (MOM) to clarify the matter. He said the phone operator informed him that it was a printing system error, and that they would send out a new letter soon to explain the mistake. Mr Yap added: "I was assured that the levy deduction was correct, and only the printing was wrong." The statement was printed by the CPF Board, which collects the levies. It sends out annual records to employers in January to show them the total levy they had paid the previous year. When contacted, a CPF Board spokesman said an error in the printing program had resulted in the records of payment showing levies that were twice what employers had paid for. She said it affected one-fifth of the 220,000 maid employers. That works out to about 44,000 employers. It happened to those who had changed their levy payment details last year. These included those who had switched their bank of choice for GIRO payment, and those who changed the number of maids they employed. It also included those whose levy rates had changed. For example, if the employer's child was above 12 years old, he would no longer qualify for the concessionary rate of $170, and would have to pay the normal amount of $265. The CPF Board said they would be sending out letters to these employers to explain how the mistake was made. The spokesman said: "We apologise for the error and inconvenience caused. "We assure affected employers that this was a printing error, and that the levies collected for the year are in order and correct. The printing program has been corrected." According to the MOM website, the Singapore maid levy, or foreign domestic worker levy, is to control the number of maids in Singapore. The CPF spokesman said letters will be sent to affected employers, showing the corrected payment records, by mail today.